Laminate floors offer the best of both worlds: great looks inspired by nature… and great livability created by science. 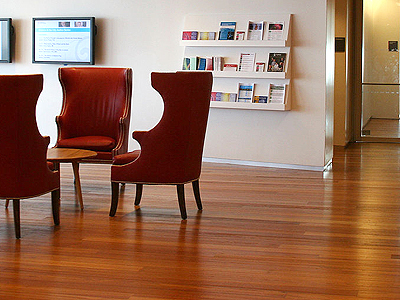 Today’s laminate flooring puts the style in your commercial space. Not only is it aesthetically appealing, but there are countless looks and textures to choose from. Whether you prefer the appearance of wood, slate or tile, laminate makes any space pop at an affordable price. Laminate flooring has come a long way. And you’ll be just as surprised by laminate that looks like tile, stone, or wood. As affordable as it is versatile, laminate flooring goes anywhere in your store front. Laminate is the perfect choice for those business locations that get a lot of traffic, like entryways and common or display spaces. It’s also ideal in basements where concrete slabs lack the level surface needed for other flooring types. And you’ll love how easily laminate floors clean up in high traffic areas. Remove spills promptly using a soft cloth and cleaning products recommended by the manufacturer. Be sure to have door mats at entry locations to keep your floor clean and free of dirt and gravel that may scratch your floor. Place protective pads beneath furniture legs, tables, desks and other easily movable furniture to reduce scratches. Replace plastic casters on chairs with rubber wheels, and lift rather than slide heavy objects across the floor. Avoid shoes with spiked or damaged heels before walking on the floor. Spiked or stiletto high-heel shoes may cause damage to laminate floors due to the extremely high compressive force they generate. Such footwear can produce dynamic loads in excess of 1000 pounds per square inch, even when worn by someone of slight or average build.